Bake a sheet cake the size that you need. With an icing filled bag and round tip, size #5, draw the tugboat on the top of the cake. 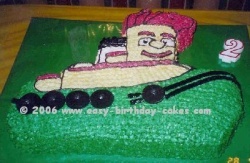 Cut the cake away from the tugboat outline. With white icing and star tip, size #18, cover Theodore’s eyes and white smoke stack. Do the entire smokestack with the white icing. The black top is added on top of the white later. Make a red colored icing and using the same size star tip, size #18, fill in all of the red areas. The red areas are Theodore’s hat, smile eyebrows and top parts of the boat. Make a green colored icing and using the same size star tip, size #18, cover the hull or bottom part of the boat. Now make a light yellow icing and cover the rest of the boat using star tip, size #18. Now place black bumper guards on the side of the boat. These are black licorice wheels found in the candy section of stores or a candy store. Use black licorice sticks for the lines by the bumper guards. Also add three strips to fit the top of the white smoke stack. Now make a black icing and use round tip, size #5 to outline the entire top part of the boat making sure not to forget the dot in the center of the eyes. Use the picture as reference.